We have had a week of rain here in Central New York, but today the Sun, and blue sky were out. And so were the fall colors. I stopped by a pond in the late evening and was able to catch this photo with the beautiful fall colors reflecting off the water. I also had a very pleasant surprise of being able to photograph a beaver as it swam around the pond. I hope to do something special with those photos. Photo details: Exposure time 1/40 sec, Aperture f/9.0, ISO 100, Focal Length 75 mm, 35 mm equivalent focal length 121mm, Lens Canon 70-200mm f2.8L USM, tripod. 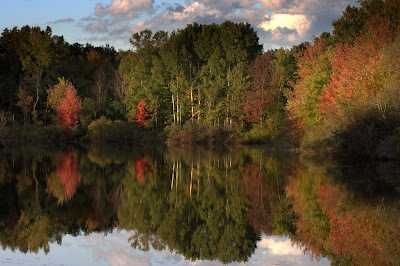 Weekend Reflections is an idea by Newton Area Photo. Join in the meme, and join the fun. Hello Steve, this pictures is so nice. The water and the colorful trees in what looks like a place of peaceful solitude. I really like how the water mirrors this wonderful scene. Thanks for being part of Weekend Reflections! I enjoyed the colorful reflection . . . I was hoping to see the beaver too! I did post some of the Beaver Shots on my http://sgallow98.dotphoto.com site. wonderful scene, autumn colours make such wonderful reflections! Just beautiful! I love the colours of this season and your shot certainly brings them out in the best manner. Beautiful reflections. When looked from sideways,it looks like a humane figure - with cap,eyes etc. I envy you that lens!! You have a very nice autumn, and the reflection captured its many colours very well. PS Thank you for the comments! I feel almost embarrassed after so many nice words :-) I like to learn myself and assume that so do other photobloggers. An exchange of information is therefore a must. I have learned a lot myself from others. I have recently joined a local photo-club and discovered how much more I need to learn :-) Good luck with your new venture and give my regards to your friends there. Of course, if there is anything I can help with, I'll do my best. this is a beatiful mirror effect ... the colours are gorgeous ! Absolutely stunning!! I love this.